SHARMINI PERIES, EXEC. PRODUCER, TRNN: Welcome back to The Real News Network. I’m Sharmini Peries, coming to you from Baltimore. With us today to discuss his picks for the most important but least covered energy and environmental stories of the year is Steve Horn. Steve is with us and coming to us from Florida while he’s on holidays. Steve Horn is a research fellow for DeSmogBlog, and he’s a freelance investigative journalist whose work is featured in The Guardian, The Nation, and Truthout. Thanks again for joining us, Steve. STEVE HORN, RESEARCH FELLOW, DESMOGBLOG: Thanks for having me. PERIES: So, Steven [spl? ], this segment let’s deal with fracking. We’ve discussed in the past how it may collapse onto itself as the current drop in the price of oil has made it financially unfeasible and far less lucrative. But this hasn’t really stopped the fossil fuel friendly politicians from continuing to support it. Tell us about the inclusion of fracking measures in the recent defense bill voted in the House. HORN: Right. Well, you know, the NDAA of 2015, most people probably were paying attention to how it affects the Pentagon and how it affects things with the Islamic State and other things that the Pentagon’s doing around the world. And that is actually what was cited in the White House’s press release that it put out once President Obama signed it off into law after Congress passed it. But included in that bill and less cited–definitely not cited by the White House, but it was cited by some of people in Congress–that’s how I found out about it, and I found out about it through industry press releases–were provisions to do two things: number one, expedite permitting of fracking on all public lands in the United States overseen by the Bureau of Land Management. That was one clause. There was a second clause to incentivize the manufacturing of vehicles that are powered by shale gas, euphemistically called alternative fuel vehicles. It’s a provision within the NDAA of 2015. Both of these were bills that were standalone bills in Congress earlier in the year that didn’t really move very far. Maybe it was ’cause Congress was too busy doing other things. Maybe it was just because they weren’t popular enough that on their own they wouldn’t move. Maybe, I think, a lot of U.S. citizens would have probably been unhappy to find out that Congress was making a major push to expedite fracking on all public lands in the United States. So what they did instead was tuck these into a 1,600-plus page bill that of course wasn’t very well advertised at all. And I didn’t find out about it until after it passed–a press release that was put up by the Independent Petroleum Association of America. And in that they really told the whole story. But they told it proudly. And they said in the press release that the ball got rolling because Senator Tom Udall of New Mexico, who’s a Democrat. And he was actually endorsed by the League of Conservation Voters, an environmental group. They gave him over $60,000 for his campaign in 2014. But he also is an industry-friendly candidate. He got over $90,000 from the oil and gas industry. What the IPAA said is that they had meetings with him dating back to earlier in the year, and with his staff, and via those meetings the original bill was introduced. That bill didn’t go very far if you look at the Congressional record. But what happened was those meetings were at least instrumental in getting the ball rolling and getting–throughout the year, IPAA was lobbying on this. So were other industry interests, such as the American Petroleum Institute and several others. And so by the end of the year the industry was lobbying behind the scenes, if you look at the lobbying disclosure records, and several interest groups were doing so. And so it’s pretty obvious, connecting where it all started, via the Udall bill, that this is the same exact thing. It’s the same bill. It was tucked in. IPAA admits it. And so there’s a direct line between it starting earlier in the year as a standalone and being tucked in. But kind of the irony of it is that just days before this passed in the National Defense Authorization Act to expedite fracking on all public lands in the United States, the Congressional Progressive Caucus, two members of it, Jan Schakowsky in Illinois and Mark Pocan in Wisconsin, they introduced their own standalone bill that would ban fracking on public lands. It was introduced only a few days before the NDAA of 2015 passed and has–now that Congress is over for the year. It was essentially a symbolic bill. They’d have to restart the whole process again with a new Congress. PERIES: And this bill will no longer make much sense in terms of its feasibility and lucrativeness for the industry because of the falling oil prices. HORN: You know. Yeah. So that is one important thing. So, first of all, that ban bill, it still has currency. If someone were to reintroduce it in 2015 and it moved, it could completely reverse this provision in the NDAA of 2015. But one important thing, to get back to your original point, is that falling oil prices were sort of indirectly cited in the Independent Petroleum Association of America’s press release. It was referred to as instability in the oil and gas market. So the industry itself and the independent producers of oil and gas, so non big oil, all the other companies, they think that by doing drill, baby, drill it can get them out of the mess that’s been created. But actually the whole mess was created because so much drilling and much oil on the market from the United States–and there’s all these other global factors–that is actually what heled the oil price drop to where it is to begin with. So it was sort of a Frankenstein that they created. So it’s not something that the whole drill, baby, drill mentality procedure can–it can’t reverse what it already created. But it was cited as the reason for why drilling on public lands is necessary. My take on that situation is that they need to keep–it’s broader than that. It’s that the industry, to keep production levels at at least a steady rate and not a declining rate, they need to drill in more and more spots to keep, say, hypothetical 1 million barrels per day level in a field. They need to keep drilling in more and more spots to keep that pace up, because each well that’s drilled has a very fast-diminishing rate of return and productivity. So this speaks to broader industry trends and it speaks to–it is sort of a desperate, desperate thing for the industry. They need new land, they need new areas to drill, just to keep drilling rates flat. And that speaks to stuff that I’ve been reporting on all year about sort of the shale gas bubble and related issues. And I think that all of this can be seen in this one provision in the NDAA of 2015. PERIES: So, Steve, let’s get back to this false dichotomy that has been created. The Obama administration has a very environmentally friendly image out there, painted as the enemy of the fossil fuel industry by the GOP. But what are the facts behind this media image, and what are some of the examples that has put this issue into question for you? HORN: Well, I think the most telling example of the falseness of this narrative and why it’s more akin to propaganda than reality is really looking at what–again what’s been happening in the courts. And if you look at a case that was just settled over the summer, that was environmental groups versus the White House and its Council on Environmental Quality, basically the Council on Environmental Quality came out and said that it does not have to weigh climate change on every single energy project that its agencies produce or that permit. And so that is the environmental groups want that to be part of the NEPA process, the National Environmental Policy Act process, which is known, at least by environmental attorneys and practitioners, as the Magna Carta of environmental law. It’s sort of akin to the Constitution of the United States, how important it is in making decisions on energy projects and infrastructure projects, etc. Well, what the White House was saying is that it shouldn’t have to consider climate change and it shouldn’t have to advise agencies to consider climate change on all of the permitting process processes. So, I mean, that is something that if it came from a Republican White House or the Bush administration, for example, it would be expected and there would be an extreme backlash by environmental groups over it. But there wasn’t much of any of a backlash or much of any of a reaction to this court decision which was handed down in August. What White House has done since then is at the end of the year they issued new draft rules that pretty much do the same thing as they said they were going to the first time, which is do exactly that, consider climate change on all infrastructure projects. But now it goes through this whole new process once again that it already went through, which is a public commenting period, a chance for legal appeals, and that sort of thing. And so by the time it’s all said and done, this will be out of the hands of the Obama administration. It will go way past 2016. Someone else will be running the White House at that point. It was basically the Obama White House’s way of looking like they–at least making the appearance that they care about climate change and making the appearance like they care about sustainable energy systems, but in reality just continuing business as usual, knowing full well that this is a process, these type of rules take years to put in place. They already had the chance once. This was actually a ball that get rolling under the Bush ministration originally. It was a challenge to the Bush administration Council on Environmental Quality. It moved into the Obama administration. And now it looks like it’s going to be basically more than a decade since or at least a decade since the original legal challenge by environmental groups until anything is done, and on such a basic issue that is considering climate change reviews or permitting processes for energy and infrastructure projects. PERIES: Another such contradiction is really the image that they’re portraying internationally. Now, Obama actually went to China and made a commitment to reduce greenhouse gas effects by making all sorts of pledgers [sic]. And then you had Secretary of State Kerry making a very well received speech at the COP 20 summit in Lima, Peru. And so they’re saying one thing to the international audience and doing another thing here in the United States. What do you think of that contradiction? HORN: Well, I think the State Department is just such a telling example of that contradiction in its split mission and really in the way that it delegates tasks in the State Department. It has an energy–Bureau of Energy Resources, and it has sort of another bureau that deals with climate change and goes to the United Nations summits and negotiates. And so the–and, first of all, the negotiations back in 2009, under the Obama administration at Copenhagen, it’s well known at this point and it was revealed through the WikiLeaks documents that the United States delegation basically threw the whole agreement under the bus there. So it’s not as if the climate change team is sort of this noble actor that is acting benevolently at these conferences. It does give nice speeches, but its actions show something else. But I think that even further than that, the State Department has his Bureau of Energy Resources that promotes all kinds of energy production around the world, technology /træns foʊr/ for teaching best practices of different energy sources. And the one that I’ve covered the most is the State Department’s Global Shale Gas Initiative, now known as the Unconventional Gas Technical Engagement Program. And so this was started under Secretary of State Hillary Clinton under the Obama administration, now lives on under John Kerry’s State Department. 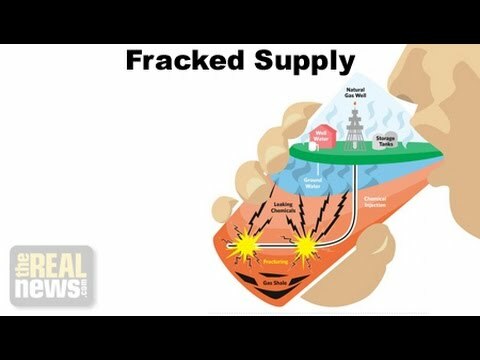 Basically, this is the United States acting as a global missionary force for fracking, going to other countries, bringing United States corporations with it, and trying to spread fracking technology around the world. It was covered really well in a fall article on Mother Jones magazine. And it’s also–and what they did was plumbed the WikiLeaks documents that are now online. And therein it really shows that–you know, so on one hand, you have the United States State Department going to these climate conferences, disingenuously saying that it cares about climate change, while it does mean it’s throwing agreements under the bus. But at the same time, you have the State Department actively out going around the world and really just doing the bidding of the oil and gas industry, the–you know, you’re probably looking broader than that, the coal industry, basically all industries. The State Department is acting as a middleman and a guarantor for opening up markets for all of these industries. And so that’s why they can say as much as they want about how they care about climate change, but even at the same time, the State Department is acting as a middleman for the very industries that are causing runaway climate change. I think that that says all that we need to know about what they’re doing. PERIES: Yeah. Steve, I thank you very much for doing this year-end wrap-up as far as the environment and the energy sector is concerned, and I wish you happy holidays. HORN: Thank you. Thank you for having me.